« Can I have some cheese with my whine? Off of Monsters vs. Aliens! On my porch! This entry was posted by Jen on July 26, 2010 at 4:40 pm, and is filed under Randomness. Follow any responses to this post through RSS 2.0.You can skip to the end and leave a response. Pinging is currently not allowed. .-= SuziCate´s last blog ..Climbing Crabtree Falls =-. No, definitely didn’t swat him! I think when I took the picture, he was in the process of dying because he didn’t try to get away as I got closer. I suppose old age got him. He was huge, almost as big as my hand! 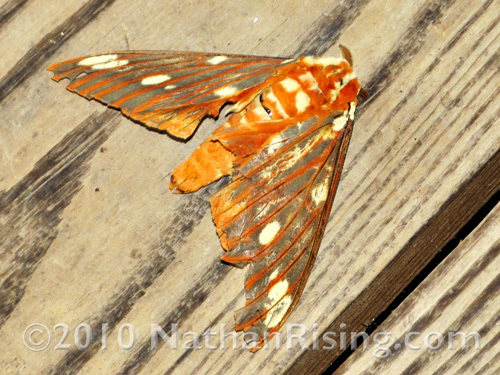 And very pretty (for a moth). I loved how bright his colors were!